Sun in Virgo will focus on making things better, while Moon in Capricorn builds the efficient framework that enables him. Both of these Earth signs are hardworking and practical, so this relationship will progress like a well-managed business. But an excess of practicality can bog these two down in dry humorlessness. A touch of optimistic Fire or passionate Water (elsewhere in their charts) can liven things up. Sun in Virgo is all about polishing and perfecting. Even when something seems flawless to other eyes, this detail-obsessed sign will spot a minute imperfection. He only wants the best for himself and his partner. Sun in Virgo is a conscientious lover, but potential partners hoping for grand romance should look elsewhere. In keeping with his efficient approach, Virgo expresses his love in the cleanest, most practical ways possible. No showy gestures or gift-buying binges for this purity-loving sign. Moon in Capricorn needs order. She’s not big on gushy displays of emotion, but with the right partner, she’ll happily commit to a traditional union. However, Moon in Capricorn will always maintain a core of independence. This means she probably won’t be a nurturing, domestic goddess (she’ll be too busy with her own, ambitious projects). But she will maintain domestic stability, and she’ll be the rock that her lover can depend on. When she feels threatened, her Shadow can emerge as a domestic tyrant who maintains control through a facade of emotional invulnerability. Moon in Capricorn will gladly support Virgo, especially when he gets wound up over little issues. She’ll talk him down with her no-nonsense brand of love. Sun in Virgo will admire Capricorn’s seemingly unshakable emotional discipline; in turn, Capricorn will encourage Virgo to take his skills even further. This relationship will hum along like a well-oiled machine, but it runs the risk of becoming a business partnership, rather than a love match. 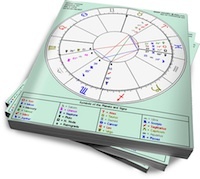 Some planets in Fire or Water signs (in either chart) can add a touch of life to what could become a rather dusty union.